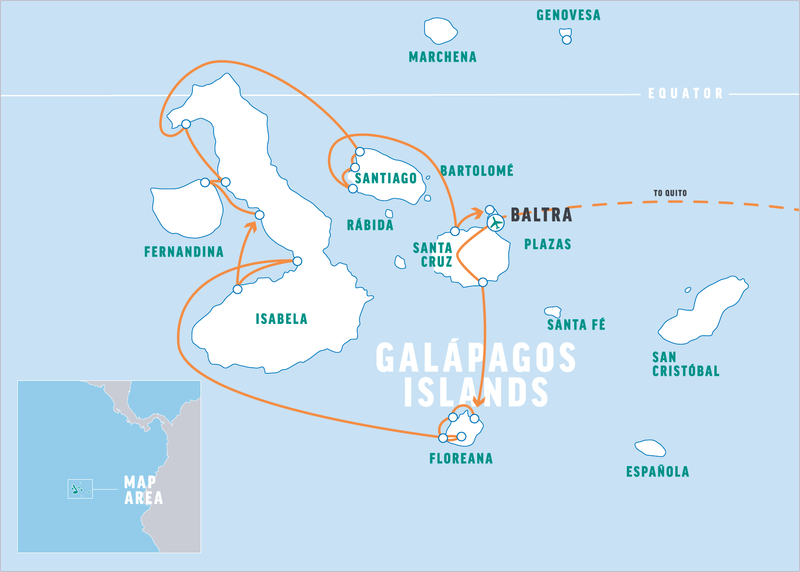 Cruising the Galápagos Archipelago is the ultimate way to see these incredible enchanted islands. Island hopping on a luxury yacht, moored each night in a different location, our permit allows us to experience the best the Galápagos has to offer. Our relatively small ship allows us to easily access places the bigger ships may not venture and our group size is far more intimate, allowing us to spend time observing the wildlife and enjoying the active nature of our vacation rather than loading and unloading from a cruise ship. Days are spent bobbing with blue-footed boobies, swimming nose-to-nose with friendly and playful sea lions, snorkeling and kayaking with sea turtles and observing breath-taking marine, bird and wildlife. Evenings offer time to lounge aboard our private vessel while savoring delightful regional cuisine prepared fresh daily. Enjoy exotic and abundant wildlife and unique, scenic locations—without the crowds—as we cruise through Ecuador’s volcanic Galápagos Archipelago on a 90 foot long deluxe yacht. Upon arrival at Mariscal Sucre International Airport, OARS will arrange your transfer to our hotel. Our hotel is located near to the international airport. If you’d like to explore the city of Quito, OARS can arrange a day tour, or you may want to consider spending additional nights in the city before or after the Galapagos program. After an early breakfast, an OARS representative will provide our transfer back to the airport for the morning flight to the Galápagos Islands. We will try to arrive at least 2 hours prior to our flight from Quito to Baltra (which is adjacent to Santa Cruz). The OARS representative will guide you through the airport check-in process. At Baltra our islands-based guide will meet us outside the arrivals area and accompany us to the canal, where a short ferry ride brings us to the island of Santa Cruz. We have a private guided transfer though the highlands with an opportunity to see some of the Galápagos flora. After lunch we arrive at a local farm where we begin our search for the giant tortoises who live in the wild in this area. Resident vermilion flycatchers are also often seen with the tortoises. We’ll continue to the town of Puerto Ayora later this afternoon and check-in to our hotel. The evening is free for you to settle in to your new surroundings and explore this bustling port, where shops, restaurants and the local population make for a stimulating atmosphere. We will visit the Charles Darwin Research Station and Galápagos National Park headquarters to learn first-hand of the conservation and research efforts in the islands. There, you’ll see several subspecies of adult tortoises, lots of hatchlings and learn of the repatriation programs that are saving several subspecies of tortoises and iguanas from extinction. After visiting the station our guide will take us on a walking tour through the village of Puerto Ayora and suggest a great place for lunch. There will be some free time before boarding our yacht, the Reina Silvia, at 4:00 PM. During this time, you may enjoy the walk out to Tortuga Beach, visiting the fish market, local shops and cafe’s or simply absorbing the local culture from a park bench. We awake at Punta Cormorant, on the eastern tip of the southern island, where penguins are often seen swimming near the yacht anchorage. In the large, brackish lagoon the usual crowd includes Pink Flamingos, Black-necked Stilts, Bahama White-cheeked Pintail Ducks, Ruddy Turnstones and other wading birds. One of the prettiest scalesias, scalesia villosa, grows only near this lagoon. From the white sand beach, we often see rays skimming along just below the surface, abundant sea lions, and squadrons of Blue-footed Boobies plunge-diving for fish. This is an important sea turtle nesting site and we frequently see the evidence – bulldozer-like trails running up the beach from the surf to craters in the sand where egg pits were dug. Just offshore is Devils Crown, a remnant volcanic tuff cone whose crater is half-open to the sea. This is a favorite location for snorkeling with sea lions and viewing marine life. Champion, a small island off the coast of Floreana, is one of the top snorkeling spots in the islands (the island itself is off-limits to visitors). Occasionally, dolphins are sighted as the boats approach the shore. This morning we land our pangas on the shore at Punta Moreno, a rather barren lava flow with interesting plants and a small pond where we may see flamingos, ducks and Great Blue Herons. It is an enjoyable walk to the pond and a great place to stretch our legs. Bahía Urbina (Urbina Bay), at the foot of Volcan Alcedo, was created in the late 1800’s when a geological event uplifted a big chunk of sea floor to the surface overnight. The shoreline is a rough jumble of huge marine corals and new lava. Flightless Cormorants, pelicans and marine iguanas are prevalent here. Not far inland is a small colony of large land iguanas—you may see them digging nests (burrows) during the mating season. Often, you can see a giant tortoise that has chugged down from Volcan Alcedo. The vegetation is varied and several species of birds nest here. It’s one of the most rewarding visitor sites. During lunch we make our way to the nearby Punta Espinoza, on Fernandina Island. This very scenic, and the most westerly island, is the youngest and most volcanically active of the Galápagos Islands. It is located over the birthplace of all of the Galápagos Islands, the geologic “hotspot” where the Nazca, Cocos and South American tectonic plates grind into one another. Ashore, we stroll over the black pahoehoe lava among hundreds of marine iguanas that are piled up together, “taking in the sun.” During the mating season you will see “mama iguanas” vigorously protecting their shallow nests in the gray gravel where the warm sun will hatch the wee iguanas. Tagus Cove is a deep, secluded bay, surrounded by high cliffs. There is a scenic and challenging trail up through the fascinating dry zone vegetation. At the end of the trail there is a fine view of Isabela’s coastline and picturesque Fernandina, just across the Bolivar Channel. Through the centuries this cove has been an anchorage for whaling and sealing ships, pirate ships, warships and a parade of commercial and private vessels. Many crews left graffiti on the cliff faces noting their presence. You can find names and dates going back a long way. Espumilla Beach is located on the eastern side of James Bay. It is a lovely place for a stroll. In the lagoon behind the beach, we may see flamingos, ducks, wading birds and sometimes even a stranded sea turtle. Vermilion Flycatchers (El Brujo) are frequently seen in the trees around the lagoon. El Brujo is a colourful, curious and very territorial little red and black bird that will study you from several vantage points. Galápagos Hawks are likely to come around to look you over; after all you are in their territory. Bucanero Cove, on the north side of Santiago, was a legendary hideout for pirate ships preying on the Spanish Galleons ferrying Inca gold and treasure to Spain. Although they posed a threat to the Spanish Fleet, they had little success and never captured a real treasure ship. This is a secret cove with a tiny beach and is an interesting site. Las Bachas is a small beach on the northern side of Santa Cruz, not far from Baltra and Caleta Tortuga. We will see playful sea lions and have time for swimming and snorkeling. In the tiny lagoon behind the white sand beach, we sometimes see Flamingos and Great Blue Herons. Sea turtles nest here from December to April. If we anchor here for the night during the hatching season—with a flashlight we can easily spot hatchlings swimming frantically for open sea. Bird life abounds as the morning sunrise lights up pink skies. Reality sinks in that this is our last day in this island paradise, as today we will make our way to the airport at Baltra. Our arrival back to the Quito area includes a return transfer to our hotel. The remainder of the evening is yours to relax—perhaps you’ll need a rest from an action-packed week exploring the Galápagos Islands! Dinner is on your own. For those with a departing flight this evening, the hotel staff will assist you with arranging your transport to the airport. As of May 1, 2018, Ecuador requires foreign visitors to have health insurance. ☐ Payments: Final payment is due in our office 130 days prior to your trip (refer to your invoice for final payment date). Please let us know if you would like us to automatically charge your credit card on file when final payment is due. Upon arrival at Quito’s Mariscal Sucre International Airport (UIO), OARS will arrange transport to our nearby accommodation–Rincón de Puembo. American Airlines and LAN Airlines offer nonstop flights from Miami; United Airlines offers nonstop flights from Houston; Delta Airlines offers nonstop flights from Atlanta. Other carriers include Copa and Avianca. The roundtrip flight from Quito to the Galapagos Islands is not included in your trip price. Once you have confirmed your reservation, we will arrange that flight for you. The cost is subject to change but should cost approximately $550 per person. At the time of reservation, we will secure the best rate available. Please do not purchase airfare until your departure has been confirmed with the minimum number of required guests. Please note: if your flight is delayed and you arrive after our departure to the islands, the morning of itinerary day 2, we’ll do our best to get you on the next possible flight. However, you’ll be asked to pay the associated costs. It is for this reason we encourage travelers to consider arriving at least one day ahead of the OARS program. Following our nights onboard the yacht in the Galápagos Islands, we will return to our hotel near the Quito Int’l Airport where you may choose to spend one final night (included in your trip price). The following day, itinerary day 11, you may take a departing flight home or continue your adventure in Ecuador or elsewhere. Flights departing late (after 10:00 PM) on itinerary day 10 are an option. This trip includes accommodation near Quito Int’l Airport for 2 nights (days 1 and 10). If you plan to arrive early or extend your stay, please contact our office if you would like assistance in booking pre- or post-trip accommodation at the hotel we use. Accommodation elsewhere should be arranged directly with that hotel. Day tours can be arranged for early arrivals or later departures. For day tours in and/or around the Quito area, ask your OARS Adventure Consultant for suggestions and rates. If you don’t have a passport, apply for one immediately because the process can be lengthy. If you do have a passport, find it and check the expiration date to see that it is valid for at least 6 months beyond your intended date of departure from Ecuador. Make photocopies of the photo page of your passport and carry one separately from your passport while traveling and leave a copy with your emergency contact at home. If your passport is lost or stolen, a photocopy will help the local consulate expedite authorization for replacement. We request that you send us a copy to keep on file for emergencies during your trip. Also, check your passport for blank pages. If you do not have at least two blank pages in your passport, we recommend that you apply to have extra pages added. Do not pack your passport in your checked luggage. On your flight to Ecuador, you will be required to complete a customs declaration form. Upon entry, a portion will be returned to you. Keep this with you, in a safe place, for presenting prior to your departure. A visa is not required for U.S. citizens to enter Ecuador for visits fewer than 90 days. For non-U.S. citizens, please check with the Ecuadorian Consulate or your embassy. As a precaution, please make copies of your important documents—passport, air tickets, visas, credit cards, vaccination card, etc. and carry them separately from the originals. These copies will prove invaluable in the event that you need to replace any of these necessary items. Bring an additional ID, such as a driver’s license. In 1835 Charles Darwin sailed on the British ship H.M.S. Beagle and visited the islands. His theory of the origin of species, which shook up the scientific world, was inspired by the evidence he found in this unique volcanic archipelago. In 1936 the Galápagos was declared a National Park to preserve its unique vegetation and wildlife. UNESCO declared Galápagos a World Natural Heritage Site in 1978 and subsequently a World Biosphere Reserve in 1985. Protection was further strengthened in 1994 with the creation of the Reserva Marina de Galápagos, which was recently extended to cover the 130,000 square kilometers within a 40-nautical mile radius of the islands making the Galápagos the second largest marine reserve in the world, after the Great Barrier Reef in Australia. Galápagos is one of those rare destinations where you become accustomed to being surprised. Nothing quite compares to the joy of observing animals in the wild here, or the sense of wonder and privilege felt while spending time with creatures that don’t run or fly away when humans approach. Galápagos is home to many endemic animals, most of which are fearless because of their lack of natural predators. From the world’s only seagoing iquanas to flightless cormorants and penguins, flamingos, inflatable frigate birds, wave albatrosses, clownish boobies, patriarchal giant tortoises, and 13 species of Darwin finches, you can enjoy thrilling encounters with animals—up close and in large numbers—who are completely at ease among human visitors. There are extraordinary opportunities to swim with marine mammals such as sea lions, dolphins and manta, eagle and golden rays, as well as thousands of the 300 species of colorful fish. The more adventurous may relish the chance to snorkel with the Galápagos sharks or even hammerheads and white-tipped reef sharks. Marine turtles and whales are commonplace and simply add to the magic. The plants of Galápagos are equally fascinating. Many species of indigenous Scalesia (“tree daisies”) as well as bromeliads and orchids are found in the highlands. Giant prickly pear and candelabra cacti abound on the coast while tiny Brachycereus cacti grow on barren lava flows. Vivid morning glories and mats of bright red and green sesuvium blanket the shores. Galápagos also has its very own native species of cotton, tomato, pepper, guava and passionflower. Many kinds of plants, particularly those belonging to the daisy family, have evolved into whole arrays of endemic species on the different islands, providing scientists with classic examples of adaptive radiation. The Reina Silvia, a 90-foot deluxe yacht, carries 12-16 passengers in uncompromising conform and safety throughout the Galápagos. From the swimming platform aft to the extended bow for whale and dolphin watching, every inch of the Reina Silvia was designed to enhance your Galápagos experience. All staterooms have private en suite facilities including shower, lavatory and vanity, along with individual climate controls. The upper deck offers a shaded lounge area to relax and gather for refreshments with the group. The yacht carries a fleet of kayaks, perfect for exploring the islands’ shorelines, inlets, bays and quiet coves. Two pangas (zodiacs) transport guests to and from the yacht for shore visits and snorkeling. Accommodation on the yacht consists of three options at three price levels for you to choose from at the time of reservation, per your interest and/or availability. Upper Deck Stateroom—the most spacious of all, it is located on the top level adjacent to the open-air lounge, bar and wheelhouse. It offers large windows for uninhibited views and plentiful natural light, a large screen TV, desk with chair and ample storage. This stateroom may be made up of a king bed or two twins. The approximate area is 160 ft². Main Deck Stateroom—located on the middle level, it is forward of the dining area & salon. This may be a good option if you prefer not to walk up or down stairs, as the dining area & salon and swim platform are on the same deck. It offers large windows and a large screen TV. This stateroom may be made up of a king bed or two twins. The approximate area is 150 ft². Lower Deck Staterooms—a staircase from the dining area & salon leads to the four lower rooms. Multiple large portholes provide daylight and views. Each can be configured with one king bed or two twins. Additionally, there is a Pullman-style berth in the bulkhead of each to accommodate a third person (ideal for younger guests). The approximate area of each is 140 ft². Your stateroom will be cleaned on a daily basis. Towels are replaced as needed, while linens will be changed once, in the middle of the cruise. Soap, shampoo and a hair dryer are provided. Please do not bring any food or drinks into the cabins in order to avoid bad odors and insects. We know food is an important part of any vacation and our talented chefs work magic in the galley creating new taste sensations and surprising twists on old favorites. Menus are varied and healthy. Special diets are accommodated to the best of our ability and children’s favorites are always available. You will appreciate snacks after snorkeling, hors d’oeuvres with sunset drinks and espresso at any time. Breakfasts aboard the Reina Silvia are buffet-style while lunches and dinners are individually served. A focus on the region’s seafood, along with beef, chicken, turkey and pork, vegetables and fresh fruit are all included in the menu. Pasta/rice and beans are frequently served. We need to know as soon as possible about any dietary restrictions we should consider in planning your trip. If you have food allergies or restrictions, we will do our best to accommodate your needs. Beyond our standard menu, we can provide options for vegetarian, vegan and many allergy-restricted diets. However, we cannot always provide the same diversity or sophistication for restricted diets, as sourcing special ingredients in the Galápagos can be challenging. Bottled drinking water will be available at our accommodation in Quito. We will provide purified water while in the Galápagos Islands, as our boat has a desalinator. Do not drink water from any tap as it frequently contains bacteria that can cause stomach problems. It is crucial that you stay hydrated while in the tropics, especially when we are hiking and kayaking. Consider bringing electrolyte powders, which replace salts and minerals lost to sweating. There is a variety of beer, wine and liquor available for purchase on the yacht. The boat’s bartender will open a consumption card for you and keep track of your purchases. You will be asked to pay your tab at the end of the trip with cash or by Visa or MasterCard. Due to the fact that there is a bar on board, we ask that you not bring your own alcohol. Draft beer on board the yacht is included in the trip cost. While aboard the yacht, the crew may be able to wash and dry items for you. This service depends on several factors: crew workload, water availability, motion of the boat, etc and is complimentary. Towels are provided and will be changed for you daily. We recommend you plan for quick washes with biodegradable soap in case you need to clean an essential item. Your guide will conduct a briefing every evening. He or she will explain the following day’s activities and talk about what animals and plants might be seen. Passengers will be transferred from the yacht to the islands on our two pangas (zodiacs). The landings may be wet or dry. Dry landings mean you step directly onto rock, while wet landings mean you step into the water and wade to shore. Your guide will tell you ahead of time what type of landing to expect. Either way, crew members will be there to assist you. Please remember you are visiting a national park and will be expected to follow park regulations. The instructions you receive from your guide are intended for the preservation and conservation of the Galápagos. The hikes on our excursions are moderate and allow you to get up close and personal with the magnificent wildlife on the islands. We recommend that your shoes be close-toed, lightweight, have sturdy soles and be broken in. If you buy new walking shoes for this trip, be sure to walk in them in advance to avoid blisters. Our two pangas (zodiacs) transport guests; sometimes our arrival is a dry landing and sometimes a wet landing. A mask, snorkel and fins are available on the yacht, but the quality may not be equal to those that you own. We recommend you consider bringing gear that you know fits you well, especially the mask and fins. A wetsuit is not provided, but can be rented in Puerto Ayora prior to boarding the yacht. The cost is approximately $35 per person for a 7-day rental (a small service fee upon return may apply). The water in the Galápagos Islands is cooled by cold ocean currents. We recommend you bring or rent a wetsuit. The only opportunity to dive is on itinerary day 3, from Puerto Ayora. Keep in mind you’ll miss the OARS activities offered this day. A dive must be arranged and paid for directly with a dive operator and is best done in advance of your trip; however, it can likely be arranged in Puerto Ayora on itinerary day 2. Remember to bring proof of your dive certification. We recommend working with Scuba Iguana to arrange your adventure. Your guide will thoroughly explain safety procedures once you are onboard. Please be sure to check exactly where the life vests are located in your cabin. In the unlikely event that the alarm sounds, you will be expected to gather your personal documents, put on warm clothes and bring your life vest to the lounge where the crew members will be waiting with further instructions. Everywhere in Ecuador, including Quito, the Galápagos Islands and our yacht, people are asked not to throw anything into the toilets, including toilet paper. A wastebasket is provided for toilet paper and it is emptied often. This may seem strange to North Americans, but please obey this rule and avoid being the cause of a backed up septic system. Thanks! Ecuador is on the 110V AC system, as is our yacht. Sockets are the standard U.S. style, either 2 flat prongs or 2 flat prongs and a round ground. There are sockets on the yacht for recharging batteries. In order to save power, please remember to switch off the light and A/C when not in your cabin. Bringing the right camera equipment will go a long way toward determining the quality of your photographs. If you’re an avid photographer, we recommend bringing a good digital or 35mm SLR camera that can be used on land and when aboard the catamaran. In addition to this, bring a smaller and less-expensive salt-water resistant camera that you can use while snorkeling, with a lanyard or floating accessory. Bring extra memory cards and don’t forget to pack spare camera batteries and/or a charger. You should be ready for mostly bright sunlight, so you may want to bring a polarizing filter. Zip-Lock plastic bags help protect your camera against sand and salt. You will be able to plug-in to recharge your camera on the boat. We strongly recommend you take out a rider on you homeowner’s policy to cover your camera—especially if it’s fine equipment. The use of electronic devices, especially music players and drones, on your trip may represent an intrusion into the wilderness experience of your fellow guests. We ask that you please be mindful of the impacts to others and respect the wilderness nature of the trip. Many of our guests travel with their smartphone even though there is limited cell service. On a trip like this, there is always the risk of water damage to smartphones and other electronic devices. If you intend to take your phone or other electronic device with you on the water, consider investing in a small, waterproof container just for your phone. Once you are on the boat there is limited communication with the “outside world.” Cell phone service is not available during much of the route. If you have someone that needs to contact you about an emergency at home, they should call our office (800-346-6277). If possible, we will relay the message to you. Keep in mind it could be several days or longer before the message actually reaches you. For your family at home you should define for them what you consider an emergency and provide them with instructions to call our office in the event one occurs during your vacation. There is no internet on the yacht, however there is Wi-Fi at the hotel in Quito. Ecuador uses U.S. dollars as their currency. Travelers should bring between $500 and $900 for the Park entrance fee, tips and other expenses. Travel with small bills, such as $1’s, $5’s and $10’s. In the Galápagos Islands, at Puerto Ayora, you will come ashore to find shops and restaurants and will likely need cash as credit cards are not widely accepted. There is an ATM in Puerto Ayora. If you visit Quito, you can use credit cards to charge purchases such as food, accommodations and clothing. MasterCard, Visa and American Express are widely accepted. You may want to check one week prior to your trip for an up-to-date weather forecast. We recommend the following websites: www.wunderground.com. The Galápagos Islands have a surprisingly cool, sub-tropical climate regulated by the cold, north-flowing (Humboldt) and west-flowing (Peruvian) ocean currents, which originate in Antarctica. Generally, December to April are the warmest months (75-90°F) and coolest from May through November (60-75°F), with August and September being the coolest months. The islands only receive an average of 10 inches of rain per year, so it is rarely “rainy”, though you can expect some precipitation year-round. The temperature of the air and water varies depending on the strength of the trade winds. During periods of weak winds, December through March, the cooling currents subside and temperatures rise. The waters are warmest during this period (65-80°F). In April, the trend begins toward stronger winds and cooler temperatures (both air and water) with the strongest trade winds and coolest temperatures being customary in late September. In October the trend reverses. And so the seasons cycle endlessly through time, with the occasional appearance of El Niño and La Niña phenomena. The larger islands with volcanic peaks have a dramatic range of climactic zones. The coastal areas are quite arid, covered with plants adapted to desert conditions, and receive infrequent precipitation. The highland parts of these islands receive moisture almost year-round in the form of garúa (thick fog, mist or drizzle), which supports a lush rainforest where all of the tortoises live. In the Quito area, which is about 9000 feet above sea level, the elevation greatly moderates the climate. The temperature ranges from 45 to 70 degrees Fahrenheit, with lower temperatures from April to October. Daytime temperatures are generally warm and pleasant, while evenings are cool. Bring a warm layer for the evenings. Ecuador is on the Equator so days and nights are almost equal in length year-round. The sun rises at about 6 a.m. and sets at about 6 p.m. The Ecuadorian mainland is five hours behind Greenwich Mean Time. The Galápagos Islands are one hour behind mainland Ecuador. Ecuador does not observe Daylight Savings Time. When Daylight Savings Time is in effect in the U.S., mainland Ecuador is at the same hour as Central Standard Time and the Galápagos Islands are the same time as Mountain Standard Time. During the rest of the year mainland Ecuador is the same time as Eastern Standard Time and the Galápagos Islands are the same as Central Standard Time. If you are taking any prescription drugs, be certain that you bring a sufficient supply to last through the trip, accompanied by a doctor’s prescription in case you lose your supply. Do not pack these medications in your checked luggage. You will not find common American drugs in Ecuador. Motion Sickness: Taking precautionary measures against motion sickness should be an important part of your Galápagos travel planning. Motion sickness is a normal response to real, perceived or anticipated movement. It occurs when the body, the inner ear (a tiny structure involved in hearing and balance) and the eyes send conflicting signals to the brain. Not everyone will be affected, but prevention is the key. While on the boat, prevention is best accomplished by seeking areas of lesser movement in an interior location of the boat or by facing forward and looking outside the boat. Avoid alcoholic beverages and drink plenty of water. Several medications are available both by prescription and over the counter that may prevent or limit unpleasant symptoms. As always, please consult with your doctor as to what would be best for you. If medications are necessary, they are best taken at least one hour before embarking. The over the counter medications Dramamine II or Bonine can be very effective for short trips or when symptoms occur intermittently. INCA guides and past clients have found success with Meclizine, the active ingredient in both Dramamine II and Bonine. In our experience, Dramamine I is better suited for putting one to sleep rather than alleviating motion sickness. For longer relief, a prescription medication called Transderm-Scop comes in the form of a patch and can be worn behind the ear for up to three days at a time. Side-effects of these medications usually consist of sedation and dry mouth and they should not be taken by people who have glaucoma or urinary obstruction. Recent studies have shown that ginger root may be as effective as the other drug treatments while creating fewer side effects. Diarrhea: It is not uncommon for travelers to have a passing experience with diarrhea, mostly induced by a change in diet. The major problem with diarrhea is fluid loss leading to severe dehydration. Make sure you drink plenty of liquids. Caffeine is a diuretic and should be avoided or consumed only in small amounts. The best drinks are bottled water, weak tea, mineral water and caffeine-free soft drinks. Avoid milk. Bananas, rice, crackers, bread or potatoes will sit well on your stomach and don’t aggravate the malady. Bring Bismuth tablets to take at the very, very first inkling of any discomfort. Bismuth, if taken soon enough, can prevent bacteria from taking over the intestinal track. Bring Cipro to treat diarrhea as once diarrhea has set in it is too late for Bismuth to prevent the takeover. Cipro is available over the counter in Ecuador, but you may not have time to purchase it there. In hot climates, cuts and scratches can become infected and take a long time to heal. Prevent infection from coral cuts by immediately washing wounds with fresh water, then rubbing with vinegar or alcohol—painful, but effective. Use an antiseptic like hydrogen peroxide and an antibacterial ointment. Prickly heat, or salt/heat rash, is a common ailment for tropical paddlers. It is caused by salt buildup in the sweat glands. The skin becomes soggy and small red blisters appear. At first sight of the rash, wash with fresh water and apply calamine lotion, dust with talcum or medicated powder and change clothes. Until the rash improves, avoid alcohol and caffeine. The sun is very strong in the Galápagos. Reapply sunscreen often and wear your hat and sunglasses. Quito is located 9350 feet above sea level, therefore you may experience symptoms associated with altitude illness. We recommend the following measures to help prevent altitude illness: arrive ahead of your scheduled departure to allow for acclimatization; drink 3-4 quarts of water every day; make sure about 70% of your calories come from carbs; only use alcohol, tobacco or sleeping aid medications in moderation or not all. Please familiarize yourself with symptoms, treatment and more about altitude illness at the CDC. Even if you aren’t anticipating your menstrual period, come prepared for it. We recommend you bring some sandwich size zip-lock bags. They can be used during the day while you are on the water or hiking and can be disposed of later. (For tampon users: o.b.® tampons are ⅓ the size of regular tampons, tuck discreetly into pockets and have less paper wrapping). Many women suggest bringing a small supply of baby wipes. Ability to walk three or more miles in a backcountry environment. Ability to walk and maintain your balance on backcountry hiking trails, including trails with rocks, roots and low branches. The trails are dusty, steep, and present numerous reinforced log steps, loose rocks, and animal excrement. They range in width from 1 to 3 feet with exposed overlooks. Ability to carry your own daypack with a minimum of 1 liter of water, rain gear, insulating layers, sunscreen and other personal items (approx. 10 lbs). Ability to remain adequately fed, hydrated, and properly dressed so as to avoid environmental injuries such as heat related illness and sunburn. Our primary goal is to minimize the risks associated with adventure trips in a wilderness environment. The trip involves physical exertion and exposure to the elements, including heat and the potential for sun, wind and rain. We have experience accommodating people with a wide range of physical disabilities and/or health conditions. However, individuals who are overweight, lack conditioning, or have other physical limitations or ailments that interfere with the realistic encounters in the wilderness can endanger themselves, other guests, and the guides. Please consult your doctor if you have medical or health conditions that could impact your ability to participate in this outdoor adventure. It is very important that each trip participant take an active role in their own safety. You will likely encounter wilderness conditions that you are unfamiliar with, and those conditions may change rapidly. It is critical to pay attention at all times, to be aware of your surroundings, and to avoid taking unnecessary risks. Even a non-life threatening injury in a wilderness setting can become a major emergency for you, and can endanger the entire group. Swimming alone or hiking alone is discouraged. Excessive alcohol consumption or illicit drug use is not tolerated. Using common sense, and following both the explicit instruction and the lead of your guides can go a long way towards keeping yourself and the group safe. Some obvious things to avoid on the trail (by way of example) are: walking without shoes, approaching wild animals, not paying attention to what is above or around that could harm you, not paying attention to hazards, and walking near precipitous ledges. While the risk of a trip is part of what makes it an exciting adventure, you must be entirely respectful of the risk that such a trip poses. It is important that you are confident in your hiking ability. Much of the clothing you bring should be quick drying and breathable. During this sub-tropical adventure you will be exposed to sun, wind and water. Long sleeves, long pants and wide brimmed hats are recommended for sun protection. In general, you will need loose fitting clothes for the hotter parts of the trip and some extra layering for evenings. Keep in mind that some of what you bring may get sweaty and wet due to the humid climate. You will encounter dust, sand and salt. No fancy dress clothing is required. Start with sunscreen, a swimsuit, shorts and long-sleeved shirt, and then add additional layers if needed. As the day warms up layers can be taken off and stored away. After a long active day, you may want to refresh and change into clean comfortable clothing. Soft, loose-fitting shorts or pants, t-shirts, etc. will allow you to truly relax in the evening. Many women find sarongs or cotton dresses a nice change. Evenings on the boat may be cool and a mid-weight jacket can come in handy. On shore during hikes, closed-toe footwear is highly encouraged. These shoes may get wet. It’s rocky on the islands so sandals are not always a good option unless they protect your toes and have hiking soles. Make sure you get good-grip, no-slip soles. You’ll be asked to remove your outdoor footwear when coming aboard the yacht—no street shoes are to be worn on board—therefore you may want to bring slippers or light-soled deck shoes if you dislike going barefoot while on the boat. Find professional-grade options made by Chaco®, the official footwear sponsor of OARS guides. A lightweight, hooded jacket is recommended. ☐ Rain gear: a lightweight, hooded jacket or poncho. Rain pants are optional. ☐ Camera and accessories. Consider a second, waterproof camera for snorkeling. We recommend soft luggage for the Galápagos portion of your trip, as it can be easier to handle for the crew and may fit better in the smaller space of the yacht’s staterooms. We recommend traveling as light as possible; excess baggage can be a burden to you and to support personnel. On an international flight, you are typically allowed 1-2 pieces of checked luggage at no additional fee but luggage restrictions are changing regularly and vary according to airline—please check with your specific airline to determine luggage allowance. Our flight from Quito to the Galápagos Islands allows two checked bags weighing no more than 50 lbs. total (23 kg), per person. The airline may refuse bags that exceed this limitation or you will be required to pay excess baggage fees. You will be required to have a luggage tag displayed on your baggage. One piece of hand luggage is allowed, weighing no more than 17 lbs. (8 kg). All luggage is inspected for organic material such as food, plants (including wood) and so on at the national departure hall for all flights to the Galápagos. For this reason we ask that if you bring your own snacks, make sure they are pre-packaged. If you feel your naturalist and yacht crew have provided a special trip for you, a gratuity will be very much appreciated. Consider giving $120-$150 per guest for the captain and crew (consists of seven people and they will share it) and $80-100 per guest for the National Park naturalist. You will also have services provided by a guide while in Puerto Ayora and transfers for your flights to/from the islands. Tipping is entirely discretionary and varies by culture. If you plan to tip, remember to bring cash. In reviewing your statement, you’ll note a $50 per person donation to the Galapagos Traveler Conservation Fund, administered by the International Galápagos Tour Operators Association, a non-profit association of travel companies, conservation organizations and other groups that are dedicated to a complete and lasting protection of the Galápagos Islands. One-hundred percent of these funds go directly to conservation, research and education in the Galápagos and your contribution is tax-deductible. For more information, go to www.igtoa.org. Please notify our office if you would prefer to delete the donation from your balance. A $1000/person deposit is required at the time of reservation. A second deposit of $1000/person is due 190 days prior to departure. The balance is due 130 days prior to departure. After you’ve made your deposit, you may transfer your trip payments to a later trip on a one-time basis for a fee equal to 25% of your payments to date. A transfer made within 130 days of departure will be treated as a cancellation. O.A.R.S. International, Inc., Pacific Marine Enterprises Cia. Ltda. and cooperating agencies act only in the capacity of agent for the participants in all matters relating to transportation and/or all other related travel services, and assume no responsibility however caused for injury, loss or damage to person or property in connection with any service, including but not limited to that resulting directly or indirectly from acts of God, detention, annoyance, delays, and expenses arising from quarantine, strikes, theft, pilferage, force majeure, failure of any means of conveyance to arrive or depart as scheduled, civil disturbances, government restrictions or regulations, and discrepancies or change in transit over which they have no control. Reasonable changes in itinerary may be made where deemed advisable for the comfort and well-being of the participants, including cancellation due to water fluctuation, insufficient bookings, and other factors. There is risk in boating and kayaking. Rafts and kayaks do capsize. You could be swept overboard. Your guide will make every attempt to assist, but you must be strong and agile enough to “self-help” without further endangering yourself or others. We reserve the right not to accept passengers weighing more than 260 pounds or with a waist/chest size more than 56 inches. We may decide, at any time, to exclude any person or group for any reason we feel is related to safety on our trips. We are experienced at accommodating people with various disabilities. Please give us an opportunity to make you feel welcome. We need to discuss requirements ahead of time. On advancement of deposit the depositor agrees to be bound by the above recited terms and conditions. Prices and itinerary are subject to change without notice. Pacific Marine Enterprises Cia. Ltda, travel partner of O.A.R.S. International, Inc., is the operator of this trip. These staff members are the very best and will strive to ensure your complete satisfaction.